Drumbeats, songs and quiet reflection greeted the winter solstice and launched the festival of Yule, marking the ancient New Year and the start of longer days and shorter nights. 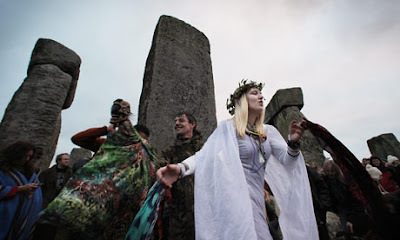 More than 2,000 people gathered from 5am at Stonehenge, some in Druid robes or with Pagan garlands – later borrowed by Christianity with the Christmas tree and mistletoe. But most were there – and at other sites such as Castlerigg stone circle in the Lake District – to escape commercialism and ringing tills. Ceremonies were brief and simple at all the sites, with activity at Castlerigg centring on Phoebe Coffey, five, and her two-year-old sister Ada, whose parents had hidden presents overnight by the 38 stones. Clutching five of the gold-wrapped packages, while mist streamed from the surrounding Skiddaw, Blencathra and Helvellyn mountains, Phoebe said: "They've been left for us by the solstice fairy." The pagans and polytheists on the have no compulsion to lead a virtuous life in accordance with the precepts of a revealed Book. According to Islam, they worship false gods in derogation of the All Merciful Creator. They have been described as “unclean”, as the Islamic view regards some of their rituals and practices to be bordered on the obscene or the morally repulsive. No other scripture is more vehement in denouncing kufr (disbelief, which is denial of the righteous truth) in all its forms, than the Qur’an. It is full of verses, which challenge disbelief of every color and shade. This verse obviously refers to a person who worships his own vain desires as a believer would worship God; and it means that he has no god but his own lust and selfishness. Sometimes, this may describe an atheist or an agnostic. This can even be a one who identifies himself to be a Muslim, but enslavers himself within his own desires and whim. Here the reference is to persons who deny everything, except their own immediate experience of life in this world. They say there is nothing but the passage of time. But, God says that they have no knowledge, so they are simply resorting to pure conjecture. In the language of contemporary discourse, we may call them empiricists or positivists or simply materialists. In fact, we have a good number of words to refer to different shades of disbelief, as we have words for different shades of belief too. In fact, the Qur’an uses two important words to refer to forms of disbelief: kufr (usually translated ‘disbelief’) and shirk (worship of false gods; often translated ‘polytheism’). It also uses the word, nifaq (hypocrisy), with reference to those who claim to be believers, but live like non-believers, or are really non-believers deep in their hearts. If we analyze the mindset of the atheists, the agnostics, the positivists and all other materialists, we can see one common factor: They are usually after what they imagine to be useful, profitable or helpful in their lives. They tend to deny God, since ‘a non-existent God’ is not useful. In the Qur’anic terminology, these are really ‘mushrikun’ (worshippers of false gods). Because, though they claim to be ‘freethinkers’, atheists or agnostics, are guided by the philosophy that is of their false gods. Thus, they are really worshippers of false gods. In modern times, we rarely meet idolaters like the worshippers of the Golden Calf, whom Prophet Moses challenged. Today’s idols are far more subtle. For instance, we see among people a passion for ‘pleasure’ and ‘fun’ that take up a lot of their time and energies. The icons of sports or fashion, pop music or movies are “worshipped” by their devotees with “religious passion”. False worship and moral corruption have always gone hand in hand. The most worldly and idolatrous ages of human history have also been the most immoral and corrupt. Both the Bible and the Qur’an narrate stories of such generations of the past. God commands us not only to eschew worship of idols and false gods, but also to give up all immorality and perversity. The message of the Qur’an is clear. It strongly castigates all kinds of disbelief, no matter where it exists or what it calls itself. The primary duty of Muslims towards all humans [irrespective of their beliefs and practices] is to call them peacefully, wisely and logically to the way of God. For the above reason, Muslims cannot be unjust or oppressive. They have to prove to the world how peace and harmony can be established here. This should be through living peacefully and serving as a model for others.